This is the time of year we all wait for in Evergreen. It's 90 degrees in Denver this weekend. Get out of the heat and hit the fun in the nearby mountain suburbs of Denver, Evergreen and Conifer. There is something happening in town every weekend all summer. 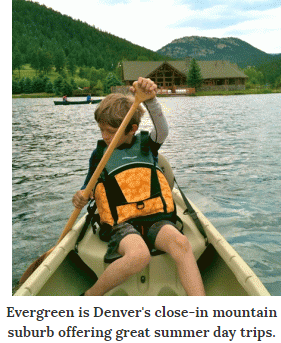 Here are a few highlights of the summer fun we have this year in and near Evergreen. 2. Evergreen Rodeo is on June 16th. This Father's Day favorite includes a parade that is a huge hit, local specials from restaurants and a real western show at our local rodeo grounds. 3. Evergreen and Conifer have incredible theatrical events all summer, plus Summer Camps for kids at the StageDoor Theatre in Conifer, plus shows all summer at Stagedoor and Evergreen Players. This year shows include Hair! and Almost, Maine. 6. The Evergreen Triple Bypass Bicycle Ride will be held July 14 and 15. This local favorite gets everyone in Evergreen involved handing out water bottles and helping to direct traffic. 9. On September 9, Evergreen Lake hosts The Big Chili Cook Off for the season's big final event. Locals challenge one another to receive the coveted prize for the Best Red and Green Chili. Lots of refreshments are sold this day. Bands and activities abound.